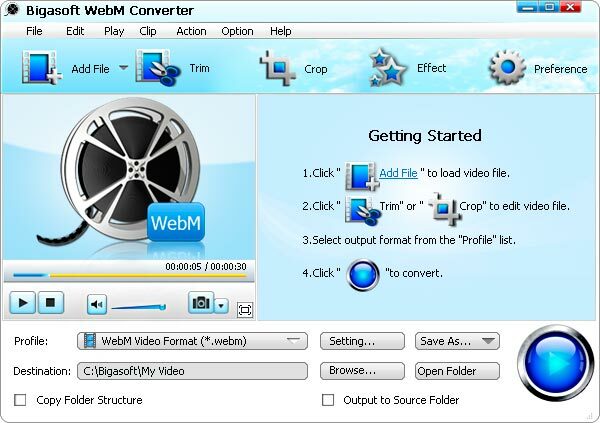 WebM Converter helps to create high quality WebM file from various video as well as convert WebM video file to any other video or audio formats in a simple yet professional manner. The professional WebM Converter can encode and create WebM video for HTML5 video from various video formats including convert to WebM from MP4, MOV, AVI, 3GP, FLV, F4V, OGM, H.264, MKV, WMV, RM, RMVB, VOB, Xvid, DivX, HD, AVCH, MTS, TS, etc. With the excellent WebM Converter you can convert popular video to WebM HD (high-definition WebM: 720p WebM, 1080p WebM or higher), standard-definition (SD) WebM video or lower resolution WebM video (under 640*480 pixels). In addition, the powerful WebM Converter can convert WebM to many other videos such as MP4, MOV, AVI, 3GP, FLV, H.264, MKV, WMV, RM, Xvid, DivX, etc., and can extract music from WebM and save as OGG, MP3, WAV, AAC, AC3, WAV, WMA, etc. Optimized preset profiles are available for a great variety of digital devices including iPod, iPad, iPhone, BlackBerry, Apple TV, Zune, PSP, PS3, Pocket PC, Creative Zen, Xbox 360, Windows Phone, Galaxy Tab and so on. 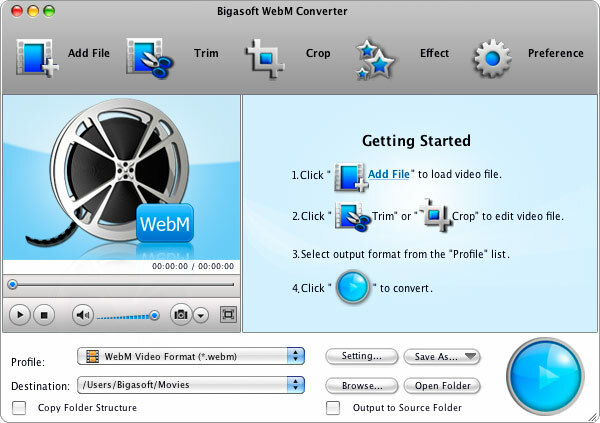 With the wonderful WebM Converter, you may preview the movies before conversion, convert video segment, crop black margin, automatically turn off after conversion, merge chapters, select audio track and subtitle you preferred, adjust the parameters to customize output effect, capture your favorite scenes and more. “Merge into one” feature allows you to merge WebM video files into integrated one file. You can just use the default parameter setting to convert to WebM (normal video and audio quality) or customize the video and audio quality at will. You may set higher or lower video resolution and set the video and audio bit-rates. Want save your favorite screen from the movie? It is possible with the video converter for WebM. You may take images of the movie and save as JPG, BMP or PNG. The interface of the WebM Converter is clear and neat with commonsense icon to guide you the conversion and custom setting. Just drag video files to the software, click “Convert” button. It’s that easy. You won’t miss it. The WebM Converter offers blazing fast conversion speed by supporting Multi-tasking, Multi-core CPU process and NVIDIA CUDA acceleration. WebM Converter supports multiple languages and you can choose from English, German, French, Spanish, Japanese, Arabic, Italian, Chinese, and more. Windows 10, Windows 8, Windows 7, Windows Vista, Windows XP, and Windows 2000. Mac OS X 10.4(Tiger), 10.5(Leopard), 10.6(Snow Leopard), 10.7(OS X Lion), 10.8 (Mountain Lion), 10.9 Mavericks, 10.10 Yosemite.